While I am generally a big fan of buy and hold investing, I'm well aware that sometimes it makes sense to unload a bad investment. Similarly, there are times when it’s smart to take some profits from an investment that has done well. But how do you know when to sell? Trying to find the right timing for the sale of a stock, mutual fund, or other investment is hard, but it helps if you have mapped out an exit strategy — a set of guidelines to give you a sense of when to sell. 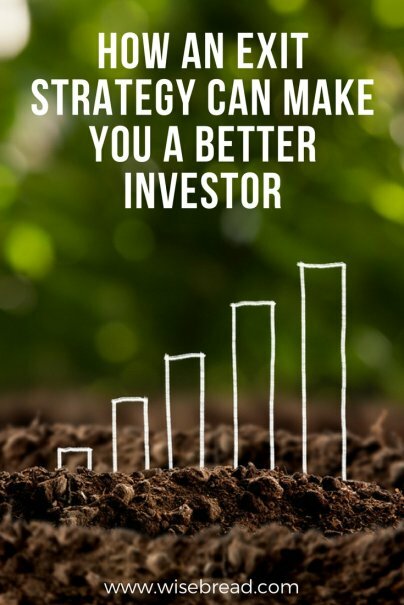 The right exit strategy can help you maximize profits from good investments and reduce losses on bad ones. If you are pondering whether to be a seller, ask yourself if any of these things apply to you or your investment. If you own shares of a company that’s struggling, it’s fine to wait and see if management can turn things around. But often, the company is in an industry that is in a downward spiral with no signs of recovery. It’s hard to admit, but there are some business sectors that are simply dying as a result of changes to technology, consumer habits, or other reasons. It’s important to know when to sell a stock when it’s a loser, but there are times when you should consider unloading a stock when it’s performed exceptionally well. The point of owning a stock is to profit, so once a healthy profit has been reached, it’s smart to at least consider taking your profits and investing them elsewhere. This is especially true when a stock is overpriced and potentially due for a fall. If you own a struggling stock, it’s often important to ask yourself whether you would buy the stock today. It often makes sense to buy stock when it’s priced very low if you believe it will rise and make you a profit over time. But if you reflect on a stock you own and realize that you’d probably pass on buying if it was presented to you now, that’s a sign that it may be time to unload. When crafting an exit strategy, note the lowest price at which you’d be willing to buy a stock. Once shares dip to that point, consider selling. If you’ve been thinking about selling a losing stock but have felt uncertain about when to pull the trigger, consider using the sale to offset your gains and save on taxes. For example, let’s say you sold some shares of one company and made $1,000 in profits. That $1,000 is subject to capital gains taxes. But if you sell a different set of shares at a loss, your tax liability will be reduced or even eliminated. This is called tax loss harvesting, and it’s one way to feel less bad about the duds in your portfolio. It’s not so much a “rule” but a guideline that many financial planners use to prevent big losses. If you have an investment that has lost 10 percent of its value in a short amount of time, it may be wise to sell before it goes down further. You can even put in place a “stop” order that automatically sells a security once it hits a certain price. For example, if you buy Facebook stock at $180, consider setting up a stop order to automatically sell it at $162. By using a stop order, you have the peace of mind to know that the investment will sell even if you are not paying close attention. It’s also possible to put in a sell order when a stock reaches a predetermined high point, so you can take profits without worry. Under this rule, the idea is that you never want a single investment to cost you more than 1 percent of your total portfolio. So for example, if you have $100,000 saved in a 401(k), you don’t want to lose more than $1,000 from a single stock or mutual fund. Having this approach will prevent one dud investment from ruining your overall retirement nest egg. Technical analysts use the term “support” to refer to the low price that an investment has historically never dropped below. At the “support” price, investors have generally decided to buy in and have prevented the price from moving lower. However, if a security moves below the historic “support” level, it’s a sign that there is more downward pressure and that things could get even worse for the investment. It’s a good idea to sell at this point to avoid further losses. Similarly, the “resistance” level is the price at which a security has been historically unable to break through. If an investment keeps approaching the resistance line but isn’t breaking through, it may be time to take your profits. There are some instances when it’s OK to stick with a subpar investment because there are few other good places to put your money. If interest rates are low and the market is performing badly, it might make sense to wait and see if an investment rebounds. But if you find yourself wishing you could put your money in other, better-performing investments, maybe it’s time to sell. There is a cost to selling, but if you free up cash to purchase something that is more likely to net you a profit, you may end up doing better in the long run.